Scalloped Potatoes au Gratin gets a healthy make-over with parsnips, leeks and lightened-up cheddar cheese sauce. 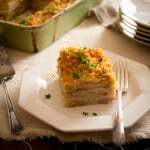 My experience with potato gratin (or scalloped potatoes) is limited. I don’t think I have made them since culinary school. I know my mom has made them on occasion for holiday meals, and I may have helped out. I don’t know the specifics really. I know there was probably a lot of cream involved, and several blocks of cheese layered in. Something along these lines. I vaguely remember that they take a whole lot longer to bake than anyone ever thinks. Being the health conscious girl that I am, my memories of them are not entirely pleasant either. I am always opting for a lower-calorie, lighter and healthier option, and potatoes gratin is as calorie dense as it gets. Add to that, I have GERD, and fatty stuff like potatoes au gratin with heavy cream and tons of cheese is like eating a pile of tacks for me. I decided to change that with this recipe. Inspiration came in the CSA share (read about what a CSA is here) when we got a pile of mixed variety thin-skinned potatoes, parsnips and leeks. I decided to cut the ratio of potatoes in my gratin down and layer in the other vegetables for a twist on the classic. I figured the flavor of the parsnips and leeks would be really nice with ham, lamb or roast beef that you’d typically have at holiday meals. Then instead of just layering in shredded cheese and cream I made a cheese sauce with low-fat milk and extra-sharp Vermont cheddar cheese. When you sub in low fat milk for cream, you can’t just pour it in and hope for the best because you run the risk of the milk and cheese “breaking” or curdling when it bakes. So it’s important to take the extra step to make a cheese sauce, thickened with flour. The starches in the flour will stabilize the milk and cheese so it won’t break at high temps. 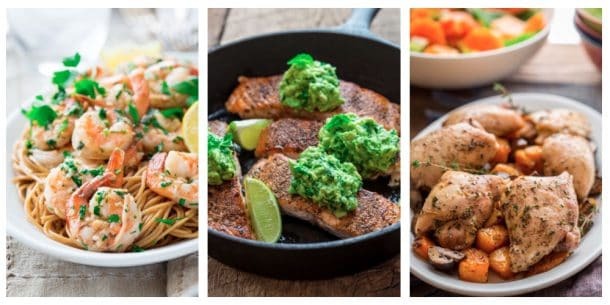 It works perfectly and will save you gobs of calories. Using a really sharp cheese means you don’t have to use as much to get all the cheesy flavor. I also boosted the flavor of the sauce with garlic, Dijon, nutmeg and 2 ounces of Parmesan for even more flavor. The gratin does take a long time to bake. So it helps to start it off covered, so the vegetables cook through. Once the cover came off, I topped it off with fresh breadcrumbs, seasoned with paprika for color and a little garlic powder. 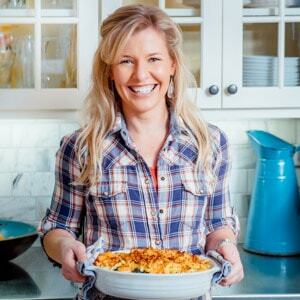 Finally a potato gratin recipe that I can love! 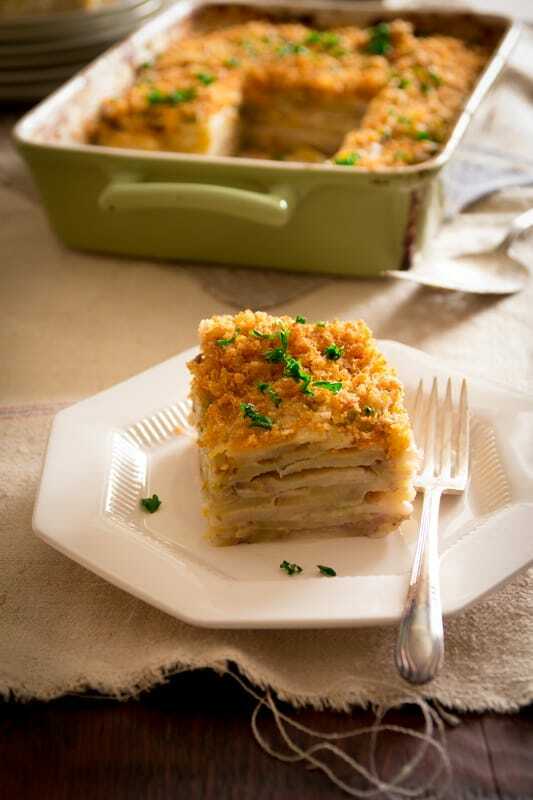 Do you ever make scalloped potatoes? What are your memories of them? What do you like to serve with roasted meat? What have you been getting in your CSA share lately? 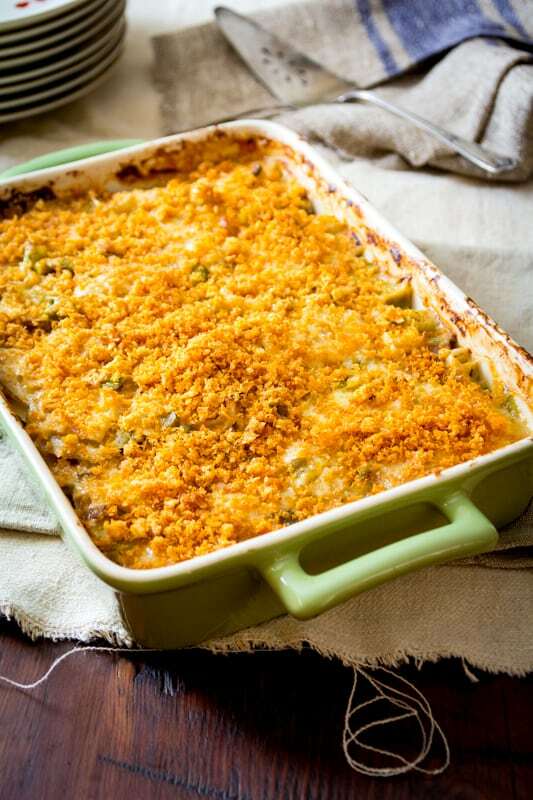 Light scalloped potato or potato gratin recipe with parsnips, leeks and extra sharp cheddar. The serving size here is really generous, so if you’re serving several side dishes, this will serve more like 15 or 16 people! Preheat oven to 350 degrees F. Coat a 9 by 13 baking dish (or similar size) with cooking spray. Heat 1 ½ cup milk and garlic in a large saucepan over medium-high heat until steaming. Whisk the remaining ¾ cup milk, flour, mustard, salt, pepper and nutmeg in a medium bowl until smooth. Whisk the flour mixture into the hot milk and continue cooking, stirring often until mixture bubbles and thickens, about 7 minutes. Remove from the heat and remove garlic cloves with a slotted spoon. Stir in 4 ounces (1 cup) cheddar and Parmesan. Whisk until smooth. Slice potatoes and parsnips into 1/8-inch slices using a mandolin or sharp knife. Spread 3 tablespoons of the cheese sauce into the bottom of the prepared dish. Layer in one third of potatoes, parsnips and leeks. Pour about one third of cheese sauce over the vegetables. Repeat with a two more layers of vegetables and cheese sauce. Cover with a layer of parchment and then foil, and bake until the vegetables are tender, 1 hour 40 minutes. Tear bread into pieces and process in a food processor until it becomes fine crumbs. Add oil, paprika and garlic powder and process until evenly moist and orange. 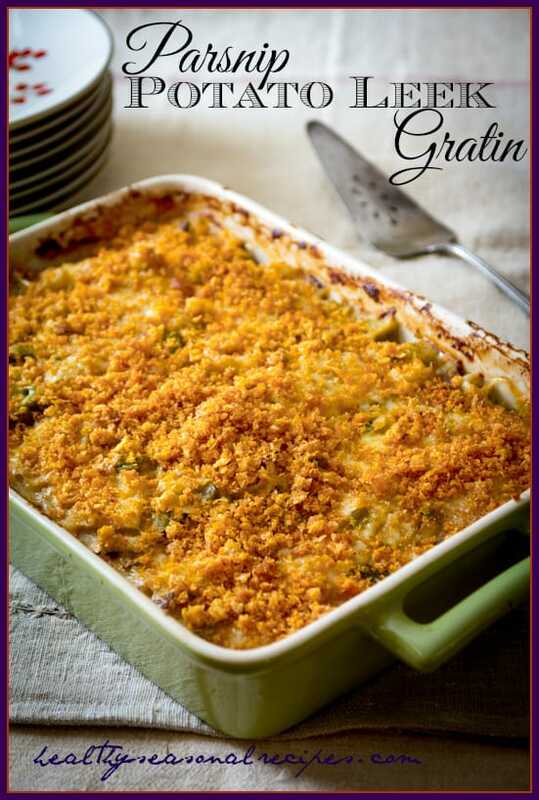 Remove foil from the gratin. Sprinkle the remaining 2 ounces (1/2 cup) cheddar over the top. Spread the bread crumb mixture over the top. Return to the oven and continue baking until golden brown, about 20 minutes longer. Let cool fifteen minutes before serving topped with parsley. Sat Fat: 4 grams. Protein: 11 grams. Sodium: 414. Fiber: 3 grams. Wow, that really sounds appetizing. My sons would love this! Thanks so much Mireya! Hope they enjoy it! this photographed incredible Katie! can’t believe this is my first time seeing it, it looks unreal! Inedible – family of three took a few bites and found the parsnip and leek combination strange almost like sauerkraut with potato thrown in for no reason. Sorry, I never review negatively but I have had two meals in my life which I made and could not finish and this was one of them. Kaye, I’m so sorry to hear that. I will send this back to my cross-tester to make sure there is not an issue with the recipe. I am totally flummoxed as to what would taste like sauerkraut since the only ingredient with a sour taste is the cheese. And there is no cabbage or cruciferous ingredient either. We’ll get to the bottom of this and get back to you asap. Thank you so much for reporting back as I wouldn’t want others to have a negative experience as well. Kaye, I wanted to get back to you about this. I had my cross-tester test this and she had some tasters try it as well. In her report she stated “I really thought this was good” and that the recipe was a “success.” She had a few thoughts of why you may have thought it tasted like sauerkraut. She wondered if possibly it was the texture and mouth-feel that reminded you of it. If so, she (and I) think that you could try 1. Peeling your potatoes and 2. Cutting your leeks according to the link. If for some reason you cut your leeks lengthwise instead of crosswise it would make the texture stringy. That link again is here: https://www.healthyseasonalrecipes.com/leek-and-parmesan-muffins/ She also thinks that using the wheat bread option will help as well. I hope some of these suggestions help Kaye. Happy cooking. Hello, I made this to try introducing parsnips to our cooking repertoire, since my husband and I love all the other ingredients. I loved it and thought the parsnips tasted like a mild carrot, slightly sweet. He couldn’t eat it at all, and described the parsnip as tasting “astringent” like medicine or horseradish, not sweet at all. Having read this comment I asked whether it tasted sour or like sauerkraut, and he agreed. So it must be a taste buds thing! I have never heard of that. It would be worth researching since I can’t think of another explanation at this point.Thank you for coming back and letting us know. Can’t understand that previous comment; leeks and parsnips are one of the sweetest vegetable combinations there are. And this did not disappoint. My proportions weren’t exact as I couldn’t be bothered to both reduce the amount for two and convert from cups but even my confirmed carnivore partner thought this was fantastic. A really tasty veggie dish as main or side. Thanks! Thank you so much for coming back to report. And I am so thrilled to hear that you enjoyed it.